This match was eagerly anticipated by all of the players as, although the game away at Peebles had been a tight affair, a win at home would all but guarantee Linlithgows place as winners of the league. The Manager was cautious about forecasting results as he was very aware of playing a team some of whom have ambitions to play in the Peebles 1st team in BT National Two would mean this could be a tricky game. In pre-match discussions with Gus McNab, the Reds captain, it was agreed that Linlithgow would play into the strong wind in the first half if they won the toss of the coin. The rationale for this is that on a very windy day like Saturday, it encourages your team to play a tighter game of rugby, as passes generally go to hand better and kicking is more difficult, with forwards and backs having to work closely together. That’s the theory!!!! 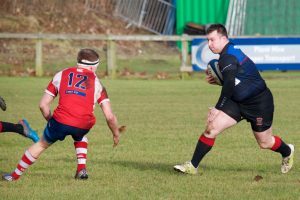 The tactic worked in the first ten minutes as the forwards carried the ball well and Drew Sommerville and Connall Black in the second row were ably assisted by the front row of Kenny McKenzie, Adam Scott and Colin Devlin. These more seasoned campaigners were invaluable playing into the wind as they don’t like too much running and prefer to rumble the ball in close quarters, which reduces the opportunities for the opposition. 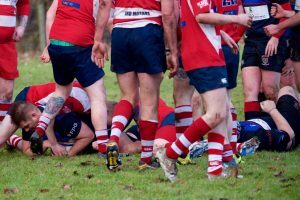 Before long a good ruck was set up in the midfield about 10 metres out from the Peebles line and as everyone fanned out expecting action from the backs, Peter Millar the scrum half nipped through beside the loose ruck and scampered between the posts. Kevin Wilson missed the conversion. 5-0 to the Reds. However from the kick off the Reds did not control the ball and there was generally a mishandling of a number of plays with the result that Peebles soon had a scrum near the Reds goal line. These scrums were uncontested, as Peebles did not have any props, so it means that your own put in is guaranteed. 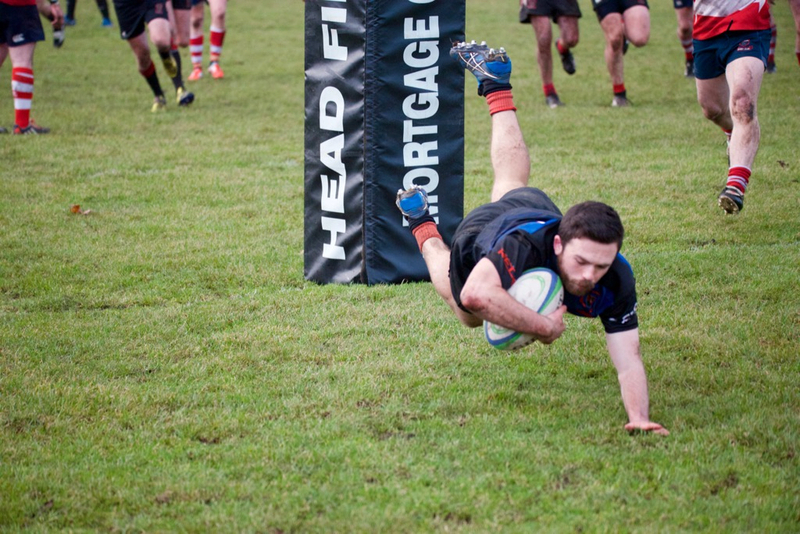 The result from this was the Peebles scrum half strolled below the posts and converted his try. 5-7 to Peebles. The Reds were now being over anxious and rushing some of their plays, which into the wind is likely to be punished. Some very poor decision making and treatment of a casual hack up field by Peebles resulted in another ruck in front of the Reds posts. Again, Peebles seemed to make easy work of this and strolled over to score a try which was converted. 5-14 to Peebles. The team was in danger of letting in more scores, but the Manager knew if we could keep within a couple of points of Peebles at half time our chances would come with the strong wind at their backs. The Reds moved up the park and Kevin Wilson slotted a good penalty from a Peebles infringement. The Linlithgow pack were being well supported by the abrasive running of Ally Walker, Mayo Herdman and Jeff Martin from the backs. Just before half time, still playing into the wind, the pack with the addition of Bruno Mochrie were carrying strongly and putting pressure on the Peebles line. From a period of such play on the line Kenny McKenzie used his guile and size to burst over from the middle of a ruck to score for the Reds. This try was not converted to leave the score 13-14 tin favour of Peebles at half time. After half time Peebles rarely made it into the Reds 22. This was due to a combination of resolute defence and good tactical kicking by scrum half Millar and standoff Wilson. Nothing worse if your a team is always having to start again from your 22 playing into a strong wind. Drew Sommerville was relishing the whole encounter and, assisted by Bruno Mochrie, was carrying very well which created go-forward ball for everyone in the Reds. All the players were contesting every breakdown and not letting Peebles settle at all in any way. This caused a few fractious scuffles which indicated to the spectators that the Reds were getting under their opponent’s skin. The Manager encouraged the same tactic, keep under their skin, keep them in their 22, contest for every ball and the scores would come either from penalties or tries. And so it proved as the Reds scored another penalty from Kevin Wilson to give the lead back to the Reds at 16-14. The Manager was convinced that we would add more scores and the backs did this by scoring a great try from a set move with Mayo Herdman coming off his wing then cutting through the centre and going in between the posts. Jeff Martin converted. The final score was 23-14 to Linlithgow, a great win for the twos. Still another game to go where we should win again. The Manager is convinced that this team with their defence and attack will win the last game. It was great to see big Jim Weir playing for Peebles (an ex student of the Reds’ Manager who he had not seen for thirty years) showing some younger chaps how its done – Des apologised afterwards for not recognising him at first. Next week home internationals, where Scotland hopes to beat the Welsh on their home turf and a lot of the Reds players and Linlithgow supporters will be there to cheer them on. David Martin; Rory McAdam, James Timlin, Ally Walker, Lewis Herdman; Kevin Wilson, Peter Millar; Adam Scott, Colin Devlin, Sam Buckley; Connall Black, Drew Sommerville; Stuart Young, Kyle Dunlop and Gus McNab (captain). Subs – Robbie Thomson, Lewis McKie, Sam McAllister, Fraser Rankine, Guy Sutherland and Kenny McKenzie.